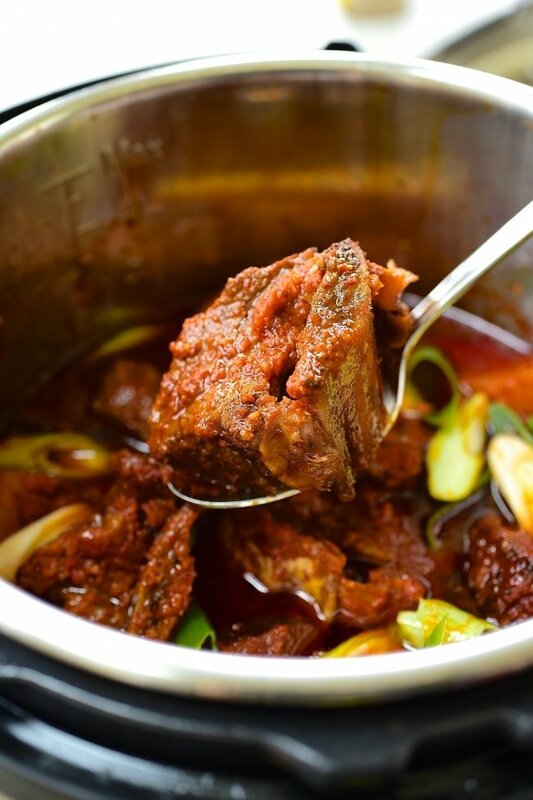 Spicy galbijjim (braised beef short ribs) cooked in the pressure cooker! 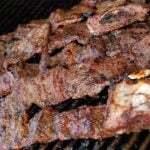 Enjoy tender ribs that are spicy, sweet and savory in a fraction of the time. 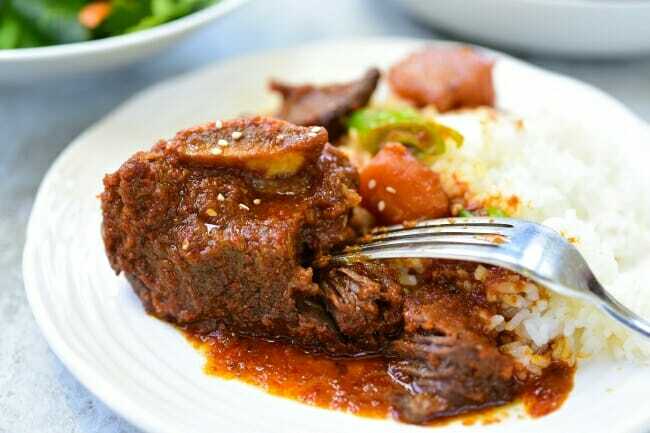 Galbijjim (갈비찜, braised beef short ribs) is something I cook over and over simply because everyone loves the sweet and savory taste of the delectably tender ribs. Lately, I’ve been making this spicy version with excellent results! It’s becoming a new favorite. 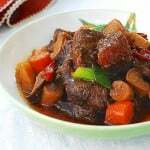 Until I bought an Instant Pot, I mostly used my slow cooker for braising tough meat because of its easy, hands-free cooking. The Instant Pot pressure cooking offers the same benefit but in a fraction of the time! 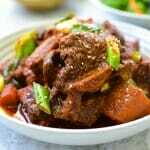 If you don’t have a pressure cooker, you can always turn to my recipe for traditional stove top galbijjim or slow cooker galbijjim. 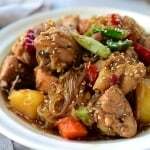 Simply adjust the seasonings to make this spicy version. 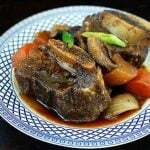 First off, look for short ribs with the most meat and less fat. I almost always use bone-in short ribs for braising simply because meat cooked on the bone tastes better. However, use boneless if that’s all you can find. Even high quality short ribs will have some fat, which is not a bad thing. 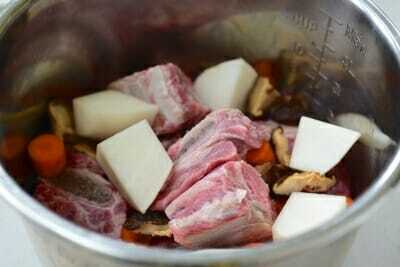 Trim off any thick layers of fat from the short ribs without removing the thin, tough skin that holds the rib together. Korean cooks soak the ribs in water and parboil to remove the blood and fat for a cleaner taste. Here, I skipped parboiling and simply presoaked the ribs in cold water to draw out the blood. Adding a couple of tablespoons of sugar to the water helps expedite the process. 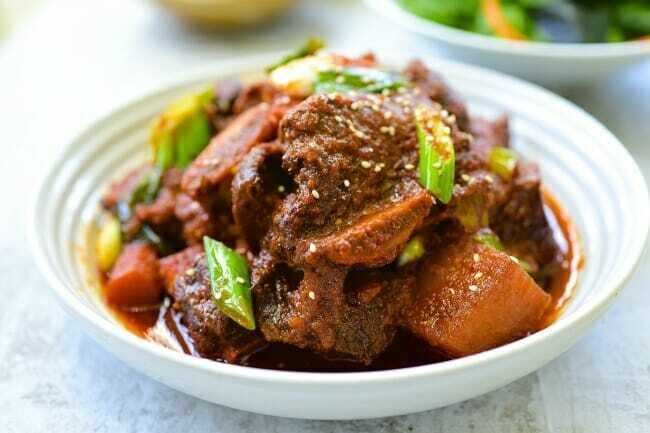 For this spicy version, I adjusted the braising liquid used for my slow cooker galbijjim to incorporate gochugaru (Korean red chili pepper flakes) and gochujang (Korean red chili pepper paste). If you like it really spicy, add more gochugaru, some dried whole red chili peppers, or fresh chili peppers. I also grated all the aromatic vegetables for the flavors to penetrate the meat faster because the cooking time here is much shorter. 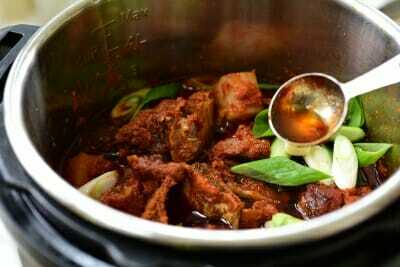 Traditionally, Korean braising does not involve searing the ribs, although more people do it in modern days. I didn’t sear the ribs in this recipe, but you know it’s easy with the “Sauté” function of the Instant Pot (see my Instant Pot braised oxtail), if you like that rich browned meat flavor. You can do all the prep work the night before, and turn on the Instant Pot when you’re ready to cook. This, of course, marinates the ribs, which is a flavor contribution as well. You can also cook the ribs ahead of time. The flavor of short ribs improves over the next day or two. All you need is about 35 minutes pressure cooking time, depending on how thick your meat is and how tender you want your meat. To let the meat rest and further tenderize, I usually wait 10 to 15 minutes for a natural pressure release before releasing the remaining pressure. 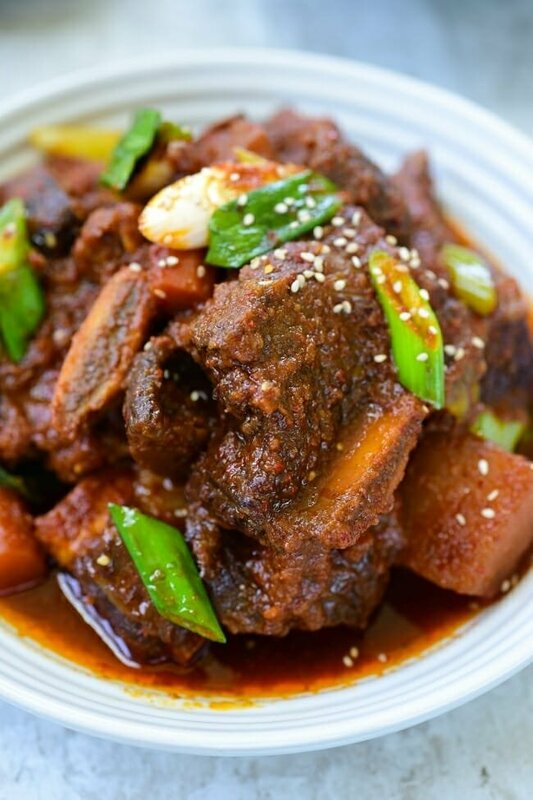 Succulent, spicy, and fork-tender Korean beef short ribs pressure cooked in the Instant Pot! Fast and delicious! Trim off any thick layer of surface fat. 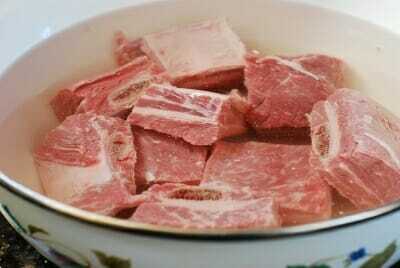 Place the ribs in a large bowl with enough water to cover all the ribs. Add a couple of tablespoons of sugar and stir until dissolved. Let the ribs soak for about 30 minutes. Drain and rinse the ribs. Drain well while preparing the other ingredients. In a small blender, blend the pear, onion, garlic, and ginger well. You can separately grate them if you want. Transfer to a bowl. Mix it with the remaining braising liquid ingredients. Place the short ribs in the pot, and add the vegetables. Pour the braising liquid over. Toss everything well to coat the ribs evenly. Close the lid tightly. Press the “Meat” function, and using the “+” button, set the time to 35 minutes. Make sure the pressure switch is turned to “sealing”. When finished, the Instant Pot will automatically turn to the “Keep Warm” mode. Leave the pressure cooker alone for 10 to 15 minutes before releasing the remaining pressure and opening the lid. You can leave it longer if you want. Stir in the scallion and the sesame oil. 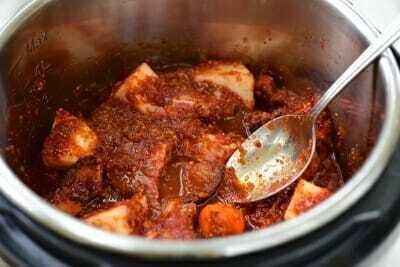 Remove the meat and vegetables from the pressure cooker. Spoon off the fat. Pour the sauce over the ribs to serve. 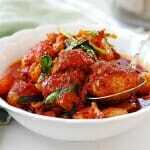 You can also cool it in the fridge or freezer until the fat solidifies to spoon off, and then reheat the sauce. Garnish with the optional scallions and sesame seeds. Thank you for sharing your beautiful recipes. Looking at a photo of your Instant Pot, I noticed the Max line is quite close to the edge. It is unlike my newly bought Instant Pot (6 in 1 pressure cooker), where the max line stops at 2/3 of the pot. Can you please let me know the size of your pot (3, 6 or 8 quarts) and its model. Mine is 6 qt. It could be due to the camera angle. Just tried your recipe and it was absolutely delicious. I used Bartlet pear and regular beef ribs since it’s what I had on hand. The spice level was perfect for me! That’s great to hear, Daniel! Love to hear you made it work with whatever ingredients you had on hand. Thank you so much for the great review! Thank you for posting this recipe! I was wondering if I wanted to double the recipe, would I double the ingredients or should I cook it twice? I have a 6 qt. instant pot. I’d suggest you do it in two separate batches. You can use a little more meat to this recipe, but doubling the recipe in 6 qt would be too much to cook at once. Can you take out the gochujang and gochugaru if you want just a normal galbijjim? Yes! 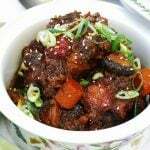 You can a little more soy sauce to supplement the salt level gochujang provides or simply use the braising liquid in the slower cooker galbijjim recipe. Can you make the braising liquid the night before, perhaps? Would it keep alright in the fridge for one night? Of course! Very good idea.